There’s a reason why Bon Appétit fans cried when it was unceremoniously announced that pastry chef Claire Saffitz would be leaving the company. Who else was going to spend days trying to get the outside of Oreos chocolatey enough? Who else was going to fuss with instant ramen noodles until they neatly fold onto each other? Who else was going to make Ferrero Rocher balls slightly too big, but announce to everyone in the test kitchen that she didn’t care? Claire Saffitz’ Gourmet Makes series on the Bon Appétit YouTube channel is about making the junk food less junk. It started with our gray-streaked queen making Twinkies, and when we all thought she was leaving she came back. Whew! She’s been back for a few videos now, and the latest episode has her churning out Cheez-Its. Each episode begins with an impossible task which Saffitz slowly researches and tinkers into a solid recipe. Whether or not you actually plan to make your own Snickers bar, the series shows what it’s like to semi-scientifically and semi-creatively work toward that tasty goal. Sometimes that means completely reworking a recipe from the ground up, taking breaks, and implementing selfish improvements just to make yourself happy with the final product. Saffitz’ creativity and perseverance is admirable in the wake of some of the treats’ steep demands. Once you watch enough episodes, you’ll see the patterns and the characters. 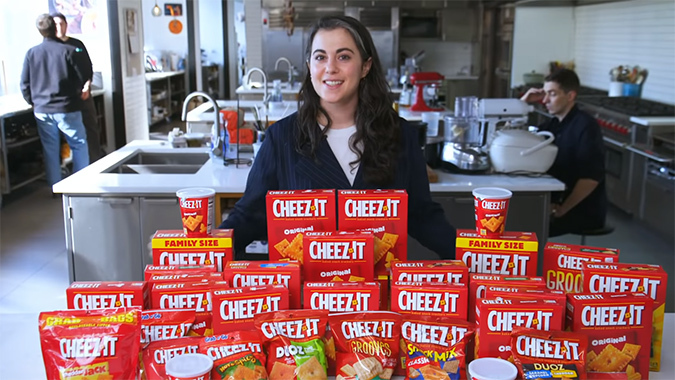 Saffitz always has a rotating set of critics and helpers in the test kitchen that include favorites like Brad Leone, Alex Delany, Molly Baz, and Christina Chaey. Leone in particular is like a tough dad to Saffitz: even if she thinks she nailed it, Leone always has a small quibble and Saffitz reluctantly reworks the recipe to his liking. Basically, when Leone is missing, it feels like a television episode where an actor was noticeably absent and the show was lesser for it. The show isn’t just about making food: it’s about the challenge and joy of making food. If that sounds like a delicious good time, head over to the Bon Appétit YouTube page to binge watch.